Emaar Development, the UAE build-to-sell property development business of top developer Emaar, said it has approved the distribution of special cash dividends worth Dh1.04 billion ($283.15 million) representing 26 per cent of the share capital (26 fils per share) to the shareholders. The approval of the special dividend comes just as the company marks a year of its successful listing on the Dubai Financial Market. The flagship developer of the UAE, Emaar Development has an impressive portfolio of 10 world-class destinations. These include the wholly-owned mega-developments such as Downtown Dubai, Arabian Ranches, Dubai Marina and Emirates Living; joint venture projects including Dubai Hills Estate, Emaar South and Zabeel Square; and a joint development project – Dubai Creek Harbour, the 6-sq-km mega-development by the historic creek, anchored by the new global icon, Dubai Creek Tower. Another key development is Emaar Beachfront, a 10-million-sq-ft Miami-style destination offering exclusive access to residents to a private beach and uninterrupted views of the Arabian Sea, The Palm Jumeirah, Dubai Marina and the Dubai skyline. The company reported a net profit of Dh1.82 billion ($496 million) during the first six months (January to June) of 2018 and revenue of Dh6.99 billion ($1.9 billion), led by the on-schedule progress in construction and timely project delivery. Emaar Development reported a total sales of Dh6.23 billion ($1.70 billion) during the first half of 2018. 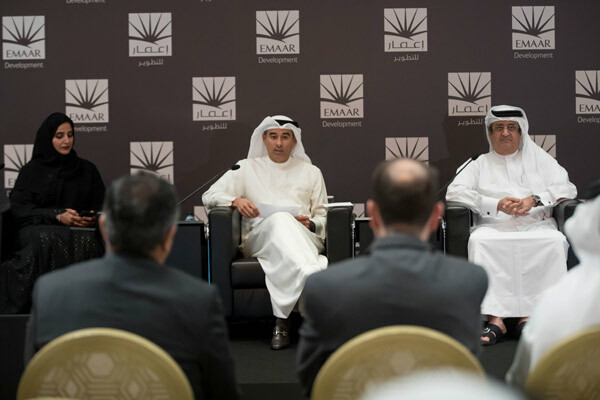 Emaar now has a total sales backlog of over Dh38.5 billion ($10.48 billion), the majority of which will be recognised as revenue over the next three to four years.